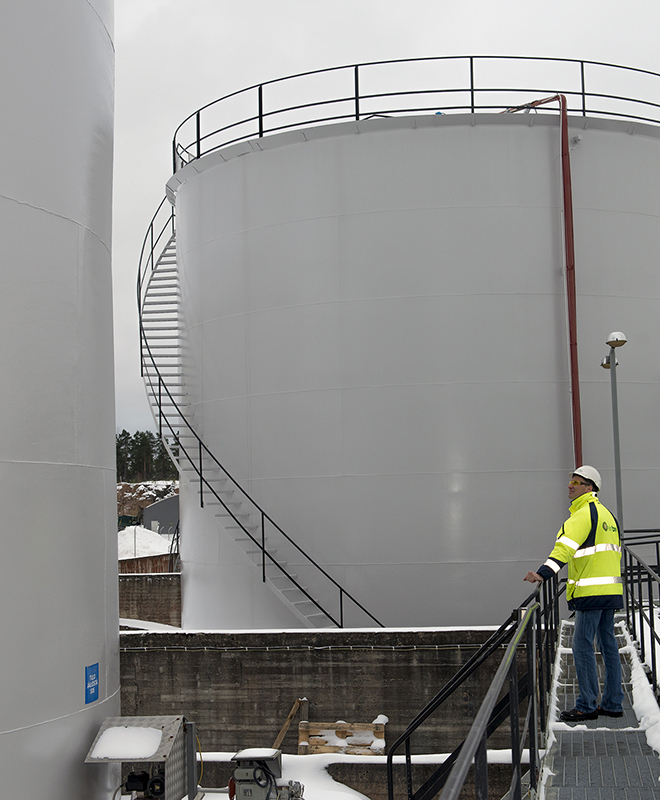 When Air BP Finland were in the process of re-painting cisterns their choice was the Isotrol Hybrid system since it only require water blasting 800 BAR as pre-treatment. Compared with sand blasting which conventional system require it saves a lot of time and a large part of the total cost of application of the paint system. Many times they pre-treatment and gathering of blaster material and paint residues take up a big part of the costs. While when water blasting is used both poorly adhering paint is removed as well as dirt and salts are washed away. The surfaces were primed with Isotrol Primer to saturate the surface and fill cracks and pores in the underlying aged paint coats. Then a coat of intermediary Isomastic, 2-comp epoxy, was applied before top coat finish with Temadur 50, 2-comp polyurethane, was applied to get the sought color and to protect from the outdoor weather conditions.